You’ve probably heard that St Johns County is one of the fastest growing counties in the US. According to the St. Johns County School District website, our county has grown by 10,473 students (45%) in the past 10 years. With this new influx of students and the projected continuing growth, the county is planning to build at least 4 new schools in these next 10 years. But, did you know the St Johns County school district per student spend for elementary-secondary school students is $7,008.92? That is 40% less than the national average of $11.392 and 67% less than New York, which spends $21,206 per child. 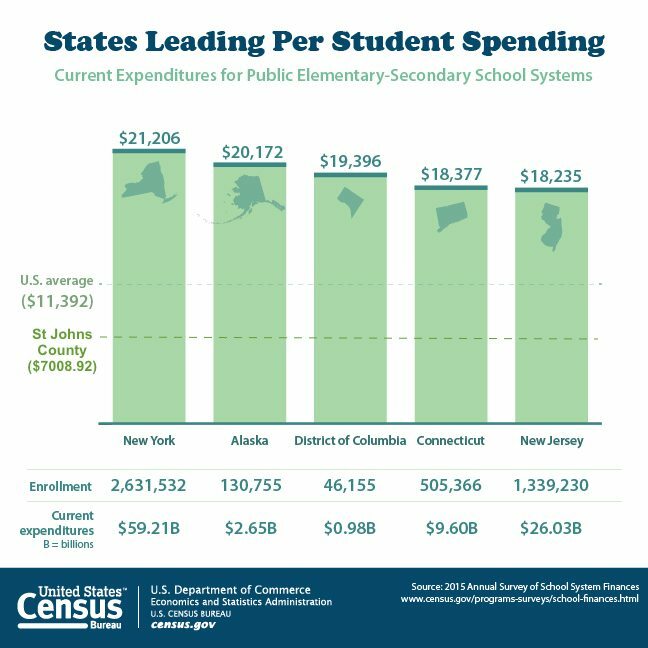 Per Elementary Student Spend in St Johns County is Below the National Average in the US. But Our District Ranks #1 in Florida. And yet…..St Johns County ranks #1 in Florida. Great leadership at the district and school level. Great teachers. And….drum roll… the PTO! Each of our parent teacher organizations raise money annually to fill the financial gap for our schools and our children, with some schools raising as much as $200,000 annually. The PTO organizations in Ponte Vedra and Ponte Vedra work diligently to support their schools with both time and money with all funds collected going directly back into the school. As you are helping your child or grandchild settle back into school this year, consider donating to your school’s PTO. Most organizations have no time commitment at all, it’s simply financial support they need. Keep Our Schools Strong: If You Have the Means. Give $ To Your PTO! We’d like to introduce you to this year’s PTO leaders in Ponte Vedra and Ponte Vedra Beach and give you, in their words, what they hope to accomplish this year. Our biggest needs are around updating all aspects of our physical campus. Our one school is in two buildings, spread over 40 acres. It is great to have a large campus. But, it also means there is so much more to maintain! The PVPV building opened in 1959 and is the oldest school building in all of Ponte Vedra. Rawlings opened in 1992. There are many things in both buildings that are in need of updating! Having an older campus also presents greater challenges when trying to keep up with technology and innovative learning in the classroom. The PTO is working very hard with Principal Catherine Van Housen to identify and solve some of our greatest facility issues. Volunteer! Engage! And, if you can, support us financially. Florida is one of the worst states in education tax dollar funding so we really rely on our parents to bridge the gap between what the state and county gives our school and what we feel we need for each student to thrive and succeed. But just as important is for us to have parents here on campus helping us. For example, our Dad’s Club has already this summer saved us a few thousand dollars by power washing the sports courts. We have a list of projects we need help with. Just throwing it out there, but The Dad’s Club will be painting basketball lines next week if anyone wants to join the fun! Click here for the PVPV/Rawlings PTO website. This is a big year for us at Ocean Palms- literally! We have more students than ever before as we wait for the new Nocatee school to open. My goal is for every family to feel connected and committed to our school this year, even if it’s the only one they spend with us. The most straight forward way to show that commitment is by joining the PTO. That money benefits every teacher and student at our school. We will continue to improve and enhance our technology and our new outdoor classroom, along with funding professional development for our teachers and so much more! Click here for the Ocean Palms PTO website. One of the biggest areas of need in our school is space. As one of the largest non-high school public schools in the county, it is a challenge to find space for all of our students and staff but our administration does a fantastic job of keeping class sizes low and is creative in their use of space. This will continue to be a problem as North St. Johns County continues to grow. Our specific goals this year are to increase volunteerism. Whether that be from working on an event committee, taking home things from the teacher to cut out, to collecting box tops at home and turning them in…any time that a parent can offer is valued and appreciated by the staff at Valley Ridge Academy. We would also like to improve upon communication and getting the word out in a more consistent manner. With a school of close to 1700 students (800 families) that can be quite challenging. Lastly, we would also like to create what we hope will become some new traditions for the school and build community between the elementary and middle school students. Click here for the Valley Ridge PTO website. We are always, always refurbishing, replacing, updating, etc. technology–for classroom instruction and for testing. As a PTO, we want to continue to support our 2nd year principal, Ryan Player, and our faculty and staff. I love to throw parties, and we love our teachers, so we’ll have a fun time this year celebrating our teachers and staff! We raise our budget through only 2 avenues: membership and business/community partners. We have to have the support of both in order to serve our school. Our goal is to continue support for our teachers and administration. Our staff is the best part of Landrum. It takes a special person to teach and motivate a middle schooler! We have the best! Click here for the Landrum PTO website. We are focused on making school fun and opening communication channels for parents and stakeholders in community. We will increase our advocacy on behalf of students to encourage the State of Florida to invest in continued high quality education program. The 21st Century Teenager is dealing with stresses that are new to mankind. They deal with technology, environmental insecurity, and competition for college admission as well as hormones, sleep habits and homework. We plan to offer programs to help families navigate these four final years for their teenagers at home. And, we will continue to support our families in search and need of a place to call home. Time, talents and treasure. Attend programs that we offer. Volunteer on campus or work from home. We appreciate the efforts of community businesses to hire our students and provide them life skills. We also appreciate the discounts and donations that parents, local business and big corporations are willing to contribute in support of the students and staff at PVHS. Click here for the Ponte Vedra High School PTO website. The Nease PTSO has its first meeting Aug 22nd. We have many board members are new, and we haven’t had a chance to discuss this years plans. However, the Nease PTSO has started the school year strong. We set up a membership table at Panther Pick up and so far we have about as many memberships as last year. This year we hope to create a system of grants that teachers can apply for so that funds raised by our PTSO will be distributed with even more teacher input than years past. Click here for the Nease High School PTSO website.